Tom Dixon, designer, on the blue whale skeleton in London’s Natural History Museum. TD It’s quite an early memory for me, seeing the scale of this thing. Everybody’s interested in the dinosaur skeletons but I guess what must have fascinated me as a child was something that was still around, that was even bigger. Even now I find it astonishing that it’s right there in the sea and we’re killing it. There’s also the fact that the whole building was designed around the scale of a whale. How few organisations or government bodies would go to those lengths to preserve the skeleton of a species that’s still in existence? There’s just something awe inspiring about something so big – and in fact related to us. There’s a diorama in the museum that shows the evolution of fish into man. So in a way it’s part of us. GB Do you like the architectural context? Is that part of the reason you chose this? TD There are much more attractive parts of the natural museum like the exotic brickwork with monkeys climbing the walls. But I like the idea of a building made to house something in that way. It’s a bit like an aircraft hanger and it’s a feat of Victorian engineering. 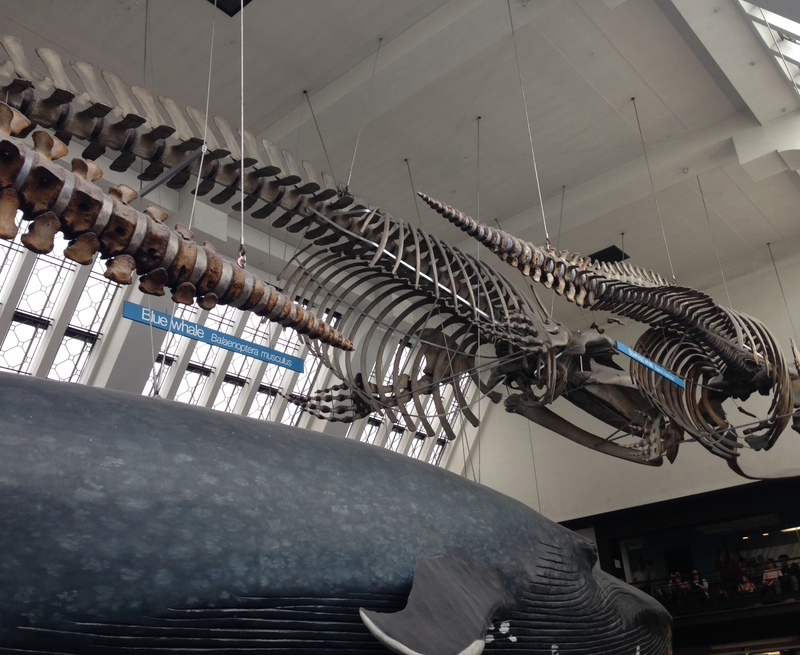 Then of course the skeleton hangs above the life-size plaster model of the whale, which is awe inspiring as well. GB And the beauty has a nostalgic element for you? TD In a way, but there’s also the importance we put in the environment. It always reminds me how inhumane it is that people are still killing those creatures that are so precious. It’s beyond comprehension that people would think they have a right to kill them. The meat doesn’t even taste that nice. But the Japanese and Norwegians persist in doing it. I think there’s something mysterious and mystical about the blue whale that’s totally relevant today. The nostalgic element just comes from being a very small boy with the hugest creature on earth right there and liking the idea of scale. I always liked the Guinness Book of Records for that sort of thing. GB Do you believe in their intelligence? We know so little about them, but even what we know, such as their use of echolocation, shows they’re very sophisticated in some ways. TD I know, we don’t know what they’re saying – if they’re singing! It’s a reminder of how little we know and how much we put at risk. We tend to think that modern science can tell us everything but there are, literally, hidden depths. We don’t know what they do at such depths and how they commute across vast parts of the globe. And they have a lesson for us perhaps, in that such enormous creatures survive by eating krill, such miniscule things. GB So beauty seems to have a meaning for you that’s beyond the visual? TD Well I was fascinated by the visual side of boiling those bones and reconstructing them with wires to join them and the rest of it. I think any small boy would be fascinated by that. And the more you look into the roots of modern sculpture, the more you find things such as pictures of Henry Moore holding an elephant skull or some fish bones. There’s something very sculptural about it. GB Has it had any influence on your design? TD I think that might be taking it a bit far! GB And do you think a blue whale is well designed? It seems a little clumsy. If you were to design a sea creature what would it be like? GB This skeleton went on display in the 1930s. Do you think it has the same impact on children now as it did then? TD The virtual world is all very well but it still remains two dimensional and when you stand next to something like this it might have even more of an impact if you’ve been spending your life in your bedroom on your iPad or whatever. To sense something of that scale couldn’t fail to inspire awe. That must be universal. GB Why do we need art when we have things like this to see? TD We don’t need art, we desire it. GB So would you prefer to have a real skeleton or a Henry Moore sculpture? TD If I could have the whale in the building in South Kensington I’d take that above a Henry Moore. It’s a whole package. But then if I could have a package I might choose the Henry Moore in front of the United Nations building in New York – and the building with it. GB D you think about beauty in your own work? TD It comes from a series of things. If something is balanced and fit for purpose and attractive in its materiality and original, it usually heads towards beauty at that point. You can’t pin it down to one thing. Beauty is a very broad concept. TD If I could describe it I would patent it and sell it back to you!